Ninja Fortress :: View topic - MGS fan art coming soon...hopefully. MGS fan art coming soon...hopefully. Posted: Thu May 18, 2006 4:44 pm Post subject: MGS fan art coming soon...hopefully. 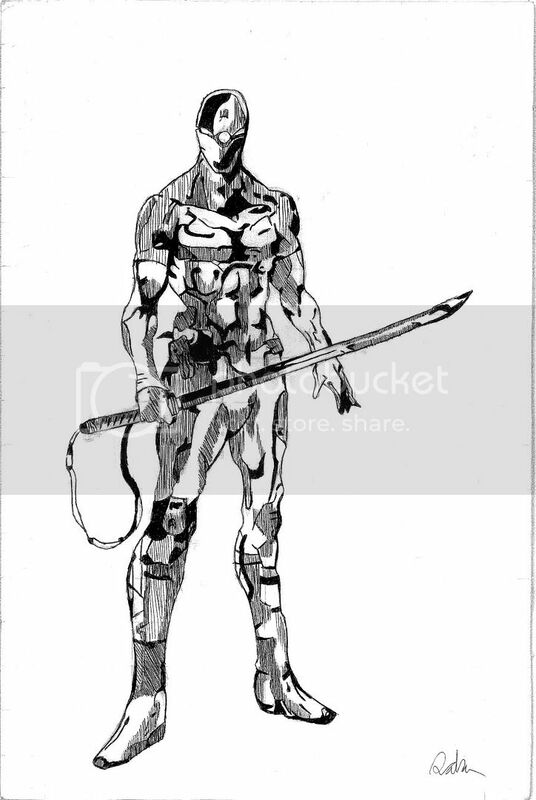 Ok, after seeing the MGS4 trailer, it got me inspired to rebeat MGS2 and start re-obsessing over Grey Fox (No Naked pansy ninja boy can change me), and picked him for my art project. Well, soon (as in 2 weeks or so), he will be done! It looks coolio so far, so I thought, hey, let the ppl know. Kinda big tho. Posted: Fri May 19, 2006 12:57 am Post subject: Re: MGS fan art coming soon...hopefully. Two weeks is a looooong time. I'm pretty curious now, and I will no doubt be impressed by the results. Well, its 2 weeks cuz I get 45 minutes in class, and get Art class once a day...so yeah. It's good so far, I want to use a mix of pen and water color for the paint. There is no Grey Fox in MGS2. I never said he was in MGS2. Just saying it got me to want to play MGS2 again. Grey FOx came into my head as I started to see Raiden being a ninja. Well, might as well post progress. Kinda done almost. Only need to do his legs and fine details with the pen. I will get Kloe or another of my freinds to scan it some times after JUne 2nd. Nice work, looking forward to it. Here it is finally. Big thanks to NoI. That's some nice work I see there man, keep it up.